‘Puffer fish’ became a burning issue in recent times when several people died after consuming this fish in different places of Bangladesh. This type of incident is not a new one, every year especially during the rainy season a lot of people are killed due to its (puffer fish) toxicity. In Bangladesh, two species of puffer fishes are found in freshwater environment and several species are found in marine environment but this number is still not specified yet. Statistically spoken, there are approximately more than 20 species of puffer fish species are found in marine environment of Bangladesh. Puffer fishes are locally known as ‘Potka’ or ‘Tepa’. 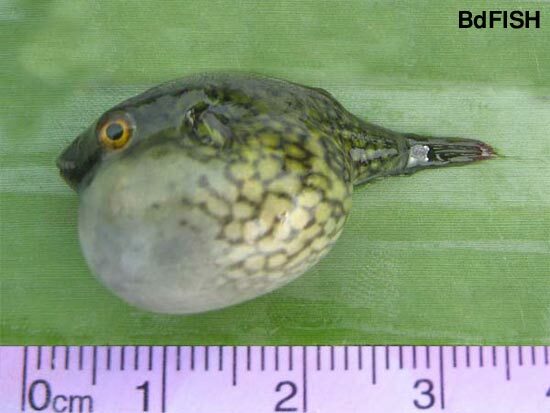 Two species found in freshwater are ocellated puffer fish (Tetraodon cutcutia and Tetraodon potoca). Among these two species, T. cutcutia is more common than the other one. However, most of the puffer fishes found in the north-west, north-east, and northern part of Bangladesh is T. cutcutia. T. cutcutia is a globe-shaped fish of yellowish-green body color above and with whitish beneath. This species marked with a rounded black colored stop at each side of the body. It has no pelvic fins and remaining all fins are rounded and grayish in color. In some foreign country like Japan, puffer fishes are considered as highly prices and delicious food items but the number of death incidents in Japan due to puffer fish is not too low. In Bangladesh, most of people do not take this fish as food. But still, some people especially poor rural people living around rivers, beels, haors-baors, estuarine and coastal areas consume this fish. In recent times, news of illness and get killed due to its consumption published in various newspaper of the country. It should be mentioned that all the puffer fishes found in freshwater environment of Bangladesh are poisonous and the poison level in there body varies with season to season. That is, same puffer fish can be poisonous in rainy season but may be non-poisonous in summer season. From research findings, it was found that poison level is very high in skin, gonad, and liver of puffer fishes than any other parts of its body. The rate of accidents due to puffer fish consumption is high in rainy season because in this time puffer fish get ready for breeding and almost all the fish remained fully matured (i.e. their gonads are fully developed). Local fishermen catch these adult matured fishes this time. After consumption of this fish, people get infected by toxic substances of the fish body and become ill initially and if the toxicity level is high then died finally. Some people believe that cooking of puffer fish by proper heating can destroy its toxic chemicals. But the truth is, it is virtually and practically impossible to eliminate the toxicity of puffer fish by heating and as a result, the toxicity level remains almost same after cooking of fish. So, it will not be a very wise decision to take puffer fish in any situation. Government of Bangladesh already published some advertisements about the toxicity in different newspaper of the country, but they should take more precautionary steps and awareness building campaigns. Also, conscious people of the society who know well about the toxicity of puffer fishes should inform and motivate un-conscious part of the society. Finally, country people should avoid all types of puffer fish from eating. Visited 3,989 times, 1 visits today | Have any fisheries relevant question?